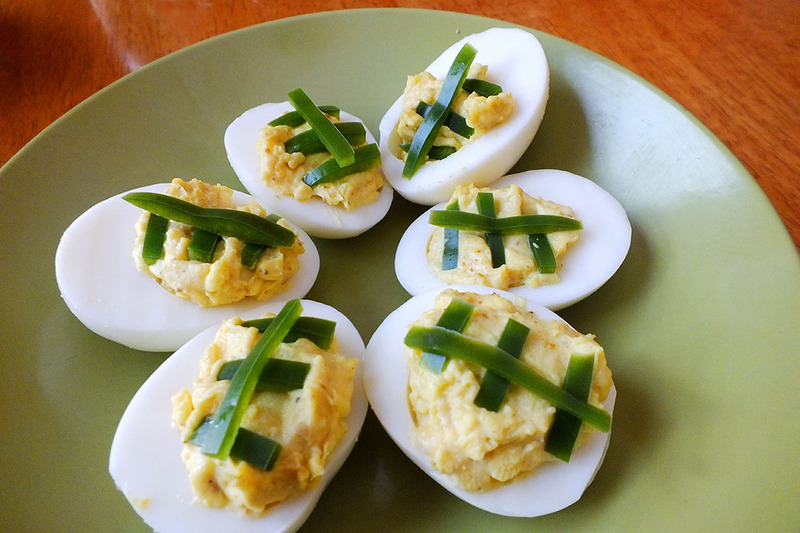 Looking for some crowd-pleasing food to make for Superbowl Sunday? Check out these recipe suggestions for a winning line-up of food sure to please the whole gang. Spoon egg yolk mixture into the egg white halves. Snip the chives into 24 1-inch pieces and 72 1/2-inch pieces for making the “football laces.” Gently press the long chive pieces into the eggs lengthwise, then press 3 short pieces over the long piece, evenly spaced, to mimic laces. Preheat the oven to 350°F. Roast the jalapeño directly over a gas flame, turning, until charred all over. Let cool, then peel and seed the jalapeño and cut it into 1/4-inch dice. In a large bowl, mix the artichokes with the jalapeño, mayonnaise, Parmesan, garlic, lemon juice, lemon zest, salt and hot sauce. Transfer the mixture to a 1-quart baking dish. Bake for about 15 minutes, or until hot. Preheat the broiler. Sprinkle the shredded cheddar evenly over the hot dip. Broil for about 2 minutes, until browned in spots and bubbly. Serve hot or warm with crackers. Preheat the oven to 350°F. Arrange a layer of tortilla chips along the bottom of a wide, shallow baking pan. The layer of tortilla chips can be a couple chips thick. Drop the refried beans over the chips in small dollops evenly distributed. Sprinkle the onions and tomatoes over the beans. Sprinkle the grated cheese over the top of chips and beans. Then sprinkle the slices of jalapeño peppers over the cheese. Bake in oven for 10 – 12 minutes, or until cheese is melted. Serve hot with salsa, sour cream, guacamole and chopped cilantro. Heat oil in heavy large pot over medium-high heat. Add onions and garlic; sauté until tender and golden, about 10 minutes. Add squash; stir 2 minutes. Stir in chili powder and cumin. Stir in beans, broth, and tomatoes with juices; bring to boil. Reduce heat and simmer, uncovered, until squash is almost tender, about 10 minutes. Stir in chard; simmer until chard is tender but still bright green, about 5-8 minutes longer. Season to taste with salt and pepper. In a bowl, combine flour, cornmeal, sugar, baking powder, cheddar cheese, and salt. In a small bowl, beat the eggs. Whisk in half and half, butter and honey. Stir liquids into dry ingredients just until moistened. Pour into a greased 9-inch square baking pan. Bake for 20-25 minutes or until a toothpick inserted near the center comes out clean. Serve warm. Whisk together vinegar, oil, garlic, honey, salt and pepper in a large bowl. Add the vegetables and toss to combine. Taste and adjust seasonings. Preheat oven to 350 °F. In a large bowl, combine the flour, baking soda, baking powder, and salt. Set aside. In another large bowl, beat the butter and peanut butter together until fluffy. Add the sugars and beat until smooth. Add the egg and mix well. Add the milk and vanilla extract. Add the flour mixture and beat thoroughly. Stir in the peanut butter and chocolate chips. Place sprinkling sugar — the remaining tablespoon — on a plate. Drop by rounded teaspoonfuls into the sugar, then onto ungreased cookie sheets, leaving several inches between for expansion. Using a fork, lightly indent with a criss-cross pattern but do not overly flatten cookies. Bake for 10 to 12 minutes. Do not overbake. Cookies may appear to be underdone, but they are not. In a small pot, add beets and cover with water. Bring to a boil and cook 20–25 minutes until very soft. Drain, puree, and set aside to cool. In a medium pot over low heat, melt butter. Turn heat up a little and add both sugars. Stir until sugar is dissolved, about 3 minutes. Remove from heat. Beat in eggs for about 2 minutes. Add cocoa powder, salt, baking powder and vanilla extract, and mix well. Add pureed beets and butter-sugar mixture and mix well. Add flour and then chocolate chips. Spray a 9 x 13 pan generously with cooking spray, add batter and bake 30 minutes or until a sharp knife comes out clean or with just a few crumbles. Let cool before cutting.